Claudio Silva made a triumphant return to the Octagon after a near four-year hiatus by taking out Nordine Taleb in the very first round via rear-naked choke in the very first round at last weekend’s (Sun., May 27, 2018) UFC Fight Night 130 event in Liverpool, England. 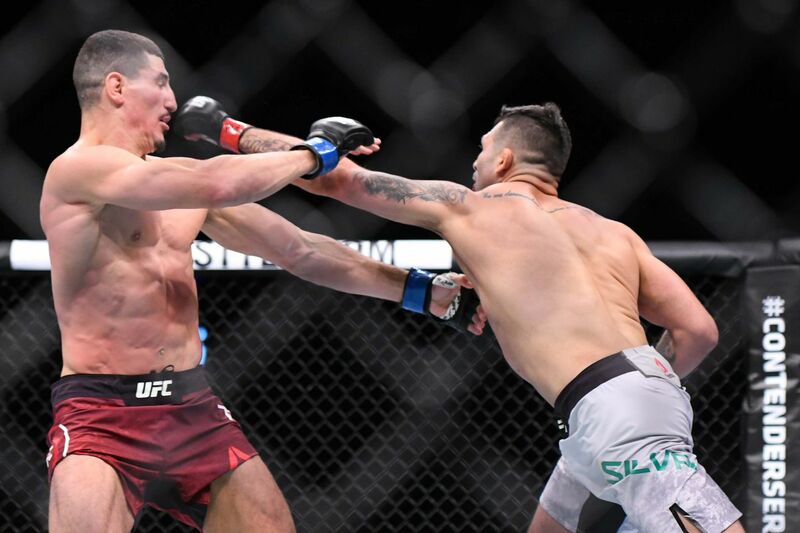 But, the two combatants almost went for round two following the fight, as they were involved in an altercation at the host hotel after an irate Nordine allegedly approached Silva to call foul play for his antics during the fight. According to Silva, Nordine hurled plenty of homophobic slurs and even stated if anyone ever spoke to him in that manner he “would kill them.” Eventually, Taleb’s teammates separated the two and prevented it from coming to blows, though Silva never expected to go that far on his end. “I’m a professional fighter at the end of the day,” Silva said. “It’s not professional to say those kinds of words. And man, I feel really bad for the sport. I come to fight. I don’t hate anyone. I just came there and did my job,” he added. While the Brazilian bomber expects the promotion to punish Taleb in due to violation of the promotion’s guidelines and code of conduct, he won’t settle their beef by granting him a do-over. Emil Meek is out of UFC Fight Night 109. The UFC announced on Tuesday that Meek was forced out of UFC’s upcoming show in Stockholm on May 28, and Nordine Taleb will now face Octagon newcomer Oliver Enkamp. Headlined by Alexander Gustafsson vs. Glover Teixeira, UFC Fight Night 109 takes place at the Ericsson Globe Arena. Taleb (12-4) is looking to rebound from a decision loss to Santiago Ponzinibbio in February. Prior to the defeat, the Canadian welterweight scored a brutal knockout victory over Erick Silva at UFC 196. Fighting out of Stockholm, Sweden’s own Enkamp (7-0) gets his first chance in the UFC after racking up a perfect MMA record with five stoppage wins in the Swedish circuit. Emil Meek won’t have to go as far for his second UFC fight. The Norwegian welterweight will take on Nordine Taleb at UFC Fight Night 109 on May 28 in Stockholm, Sweden, the UFC announced Friday morning via its Europe Twitter account. Meek (9-2, 1 NC) defeated Jordan Mein in his UFC debut via unanimous decision at UFC 206 in Toronto back in December. “Valhalla” has won four straight, including a notable first-round knockout of Rousimar Palhares in May 2016. Meek, 28, is one of the top prospects from Scandinavia. Taleb (12-4) dropped his last bout to Santiago Ponzinibbio via unanimous decision in February. The Tristar Gym product has now lost two of three. Taleb, 35, sports a 4-2 UFC record after a run on The Ultimate Fighter Nations. UFC Fight Night 109 is headlined by a light heavyweight contender bout between Alexander Gustafsson and Glover Teixeira. Also on the card, rising light heavyweight Misha Cirkunov takes on fellow up-and-comer Volkan Oezdemir.